Jewelry made by US Serviceman in the South Pacific during WWII from the collection of Byron Roche. WASHINGTON -- I don't know when in history anyone ever did actually beat swords into plowshares, but in a just-opened exhibition at the Australian Embassy here, there is what must be easily judged the next best thing. You could call it bullets into bracelets. In addition to the vicious brutality of the combats, the campaign in the Pacific during World War II had two other distinctive features: a lot of idle time between battles, and an abundance of war junk, especially the warplanes that were shot down all over the place. An amazing and gifted number of American troops fighting their way up from Australia to New Guinea to the Philippines -- along with their Australian counterparts -- used their idle time, tools and handy military machine shops to transform useless war materials into carefully crafted jewelry they sent home to their wives and sweethearts. Some of the designs, of course, are what you might find on customized Zippo lighters that were so ubiquitous in the American military. Some were a bit politically incorrect as today's world views things. One cuff bracelet on view in the Embassy's exhibition, "Sweethearts Across the Pacific," was made with metal from a wrecked Japanese airplane and is inscribed to "Bubbles . . . From Your Pal Willy." On the other side it says, "Made from a Jap Zero." Another bracelet made from pieces of a downed Japanese warplane, made by a Navy CB (short for "construction battalion") named Hank, is inscribed to "Etta" and says, "A nip made slip, this strip from ship." The workmanship is superb, even when the material at hand was a piece of Plexiglas. 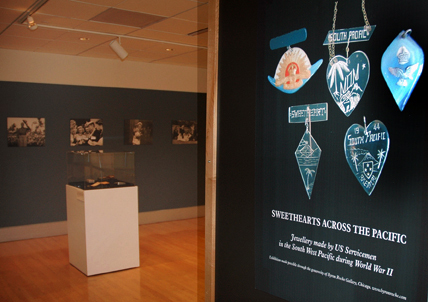 One such pin inscribed with the word "Sweetheart" bears the images of a volcano and a palm tree. Another piece that could be worn as a pin or pendant is an exquisite miniature replica of a P-38 Lightning made from, among other things, three machine gun bullets. The works in the show were collected by Byron Roche, a Navy Vietnam War veteran and proprietor of the Byron Roche contemporary art gallery on Chicago's Franklin Street. Roche began acquiring war jewelry for nostalgic reasons; his father was one such warrior/jewelry-maker. "My father was in World War II and had some mementos that interested me very much as a child," Roche said. "He had his pilot wings made into a bracelet, and he carried a carved figure of a pilot throughout the war. These pieces were in his top drawer, and I often asked him to show them to me. "He died about 12 years ago, and I now have the pieces on my mantle. My mother was a Marine during World War II, and she had several bracelets and a wooden box from that period that I also treasure." Roche said that with the actuarial tables catching up with so many World War II vets from the Pacific in recent years, heirs began finding the trinkets in the backs of dresser drawers, in attics and other odd places. Some were kept as heirlooms, but others have turned up in antique stores, or at garage sales, auctions and the like. "I have always enjoyed going to antique stores, and about 20 years ago, I started seeing mementos like my father's coming up for sale," he said. "A lot of the things I saw were made out of Australian coins, pieces of metal tortoiseshell, wood, airplane parts and shell casings. . . . Many of the pieces of jewelry were sent home to wives, girlfriends, mothers and children and were worn proudly on the home front." But for some descendants not directly connected with the World War II generation, the significance and intrinsic value of these pieces was not always apparent. "Many of the families didn't know what these items were or what to make of them, so they sold them," he said. "I have put together a collection of several hundred of these pieces. By the time I get them, most of the time the history and names of the people are lost but a lot of the feeling from the time and personal sentiments are still there." Two paired bracelets in Roche's collection were made from Australian coins assembled in heart shapes. Both bear the words "New Guinea" and "Philippines," but one is inscribed "Dear Mother" and the other, "Dear Sister." "I got these bracelets at auction, and the seller said that the person that sent these bracelets home had been killed," Roche said. "The American flag that had been sent home with his body had already been sold." Another item he found particularly poignant was a very small bracelet made from wartime scrap metal that was designed to fit the wrist of a child. On one side, an anchor is engraved, along with the words: "June, U.S.N.R., 1943." On the other side it says, "I miss you and mother so much, from Dad." 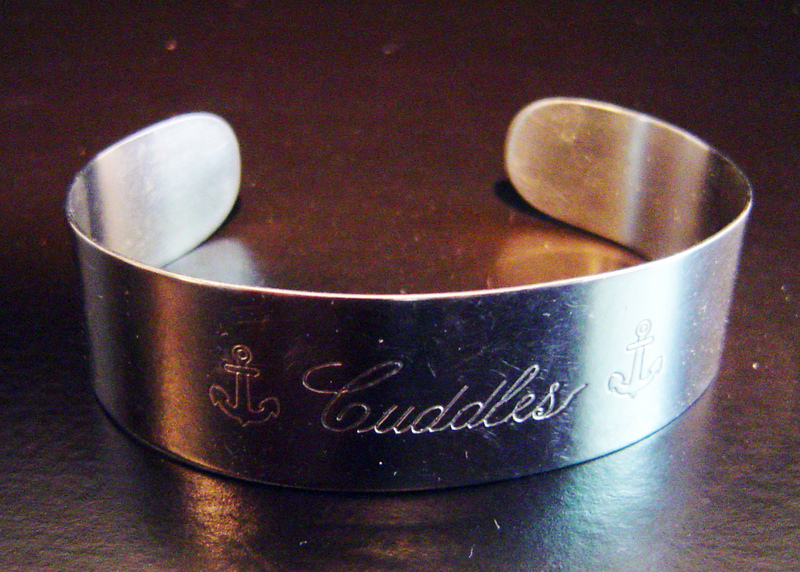 Another has two anchors and the inscription, "Cuddles," though she was probably not a child. The exhibition had been for visitors to the Australian Embassy only, but this week was opened to the public, noon to 2 p.m. ET Mondays through Fridays. It closes July 3. The embassy is at 1601 Massachusetts Ave., N.W. Call 202-797-3383.